Today, a new prospective tool was introduced for bicyclists to defend themselves from harassment and assault. An anti-harassment ordinance, the motion to draft it being originally introduced by Council Member Bill Rosendahl, has been released today by the City Attorney’s Office. Pending council approval, bicyclists will be able to bring civil suit against drivers who assault them, harass them, threaten them, or intentionally distract them. 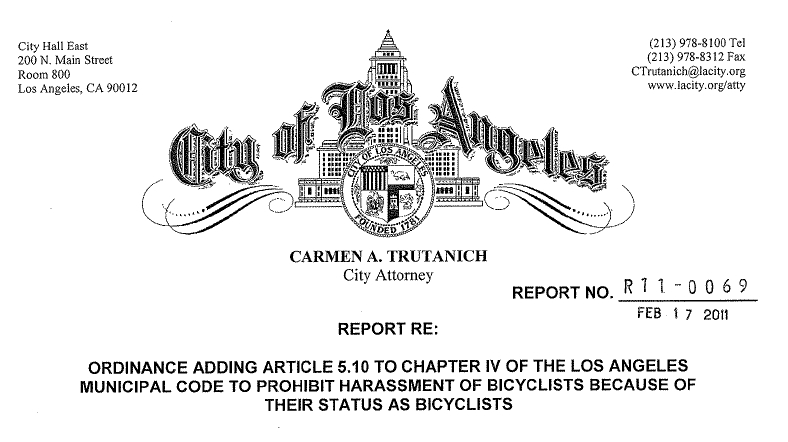 In the ordinance, the City recognizes not only that “people have a right to ride a bicycle in the City of Los Angeles”, but also that bicyclists are harassed and assaulted simply for being bicyclists – this ordinance gives bicyclists the right to go after offenders in court. The ordinance is now a public document, so you can read it yourself. While it’s always been illegal to assault (or threaten to assault) a bicyclist, it has been extremely difficult in the past for authorities to prosecute drivers. That’s because if a police officer isn’t on hand to witness the altercation, there generally isn’t enough evidence to prosecute a driver in a criminal case. Cases of attempted assault are particularly hard to prove; a bicyclist using all their skill to avoid the assaults of an out-of-control driver is left with no physical evidence that an assault took place. There are also instances where the intentionally aggressive actions of a driver towards a bicyclist may cause a crash – just not with the driver that initiated it. The second stipulation is a very important one. Explicitly covering attorneys’ fees will make it much more likely for a lawyer to take cases with comparatively small monetary damages and make bicyclists far more likely to pursue civil suits when they are threatened, harassed, or assaulted. Another important point to keep in mind is that nothing in this ordinance precludes bringing criminal charges against a harassing or assaulting driver. Rather than replacing any existing laws, this ordinance provides an additional supplement to help bicyclists defend themselves. We’d be remiss if we didn’t offer a hearty thanks to the bike community for making this ordinance a reality. The LA bike community unanimously stood in support of this ordinance, and we’ll need their continued dedication to ensure its passage. Wow. Just wow. I can’t believe it. I have rights!!! We all have rights! It’s true that there are some inconsiderate bicyclists, but riding 2-3 abreast isn’t illegal depending on the street configuration. Assaulting a bicyclist is. Right, depending on the situation and that’s what I’m ta;king about. Bottlenecking a highway by riding in such a way that cyclists inconvenience 1000’s of motorists breeds contempt for those cyclists. And assault is illegal no mater what- cyclists or golfers or whatever should have no more protections than anyone else. Are you kidding? With the unusual exception of critical mass, which I and many other bicyclists disapprove of, when does that actually happen? Even critical mass only happens once a month relatively late at night. In most cases the worst thing that drivers have to deal with is changing lanes to pass. Occasionally they might have to slow down and wait a few seconds for a safe opening to pass. That’s the exception rather than the rule. Drivers are inconvenienced by slow motor vehicle traffic like buses and people parking far more often than by bicyclists. Nobody ever heard of Lance Armstrong when I first started being harassed for riding my bicycle in the roads in the 1980’s. Armstrong was still a kid at the time and not famous. Unfortunately, your extreme ignorance of bicycling prevents you from knowing that. Moving over to pass a bicyclist or a group of bicyclists is trivially easy. I’ve done it hundreds if not thousands of times in over three decades and over half a million miles of driving. Unfortunately, people who didn’t pay attention in driver’s education sometimes suffer from the delusion that they shouldn’t have to do it. By state law, bicyclists have as much right to use the road as motorists. By state law, drivers are required to maintain a safe distance from bicyclists when passing. If you don’t know what I’m talking about then I think that you are the ignorant one, not me. If you’ve been hassled since the 80’s then maybe you are the one who has a problem because what I’m talking about has only been happening over the past couple of years not decades. secretagent: You haven’t been out on the roads on a bike. I have. I know lots of people who’ve been on the roads since then. We all say the same thing. Drivers harassed bicyclists regularly back then and they do so now. The only thing that has changed is that there are more adults riding bikes now. You’re just making stuff up. I know because I’ve been out there, and so have my friends. I ride in full accordance with the law, which I’ve studied heavily. I also ride in accordance with the recommended safety techniques from the League of American Bicyclists, the premier bicycle safety organization in the country. I’ve read books on bicycle safety. I count among my friends some of the top bicycle safety experts in the country as well as a couple of bicycle lawyers. I’ve spent many hours discussing both safety and law with them. In other words: I know what I’m talking about. I’ve done my homework. I’m ready for class. Are you ready to get schooled? I get harassed several times a month — always when I am riding legally and safely. The drivers who are harassing me think that I am violating some law by riding in the road. CVC 21200(a) gives bicyclists the same right to be in the road as motorists. I often ride in the middle of the lane depending upon road configuration/conditions for safety reasons. When I’m doing it, it is in part because I’m allowed to do that by one or more of the many exceptions stated in the keep right law for bicycles CVC 21202, though mostly it’s because I want to be safe in the road. I know the law. I know safety from the real safety experts. You clearly do not. 1. You have absolutely no idea whasoever whether or not I have been out on the road, as you put it. 2. Riding in full accordance with and a heavy study of the law is no great feat so I wouldn’t go around tooting my horn over that if I was you. 3. You’re right about one thing and that was what I was attempting to point out- there are indeed more riders today. In any situation that brings about a rise in population there’s going to be problems. And the problems are two fold- there’s more car traffic and there’s more bike traffic. 4. Just because you say you know what you’re talking about does not mean in any way that you really know what you’re talking about. I think you’re just expressing how you FEEL. I’ll restate my original premise- Many cyclists are bringing a lot of contempt down upon the entire cycling community by disrupting traffic. It doesn’t matter how you FEEL or how heavy you’ve studied the law. That’s a fact. I’m done with this topic. Take care, be safe and don’t be one those guys. I absolutely know that you weren’t on the road in the 1980’s. If you had been, then you would know that harassment was common even then. It was common in the 1990’s. It has nothing to do with Lance Armstrong. Anybody who says it is, is just making stuff up out of thin air and pretending to know something. I was riding on the road then. You’re just making stuff up. I absolutely know that you know nothing about bicycling because anyone who characterizes bicyclists as “Lance Armstrong wannabes” is someone who knows nothing about cycling. Most people don’t know the rules of the road, especially when it comes to bicycles. Most people think they do, but most people get it wrong. I know because I study well enough to know. I don’t just feel that I know what I’m talking about. I didn’t make up my ideas about safety. I learned them from the leading safety experts in the country. I’m not arrogant enough to pretend that I can know bicycle safety without studying it. That’s the difference between you and me. I study from real experts and I know the facts. You make stuff up out of thin air and pretend that your ignorance is better than my knowledge. Sorry, but it really isn’t. I’m a super considerate rider in an area where everyone else rides on the sidewalks. I choose to ride in the street cause I don’t want to hit all the random families walking to school! And yet, I still get so much hatred from people. I really don’t think they are reacting to ill-mannered cyclists; they want me on the sidewalk like the day laborers. So to say that ill mannered cyclists cause this is so very wrong. Also, I am on a 20lb. contraption. I think deserve some sort of additional protection against misbehaved vehicles orders of magnitude heavier than I. What has to get done to make this law? Who can I call, write, email? I had a run in recently where the police said they couldn’t file a report because the driver’s actions “bordered on criminality.” I want to make sure I have some recourse against this in the future. The small minority of drivers who behave like that do so because they suffer from the delusion that they should not have to move over to pass a bicyclist safely. They probably have that delusion because they did not pay attention in driver’s education class. In other words, they are ignorant of the rules of the road. Given how trivially easy it is to move over to pass a bicyclist, they are also extremely petty and childish for getting so upset about it. Jeshii, you can call or write your City Council Person today; refer to Council File 09-2895. It also couldn’t hurt to contact Transportation Committee Chair Bill Rosendahl and Public Safety Committee Chair Greig Smith, as well as Council President Eric Garcetti and Mayor Villaraigosa. I’ll give as much notice as possible of upcoming hearings in my blog, and I’m sure Chris will here, as well. And if you haven’t already, I’d strongly recommend joining the Los Angeles County Bicycle Coalition (LACBC), which has been a strong proponent of this bill, as well as fighting for the rights of city cyclists in other ways. Have any of you ever noticed that the time it takes to go to the store or run an errand by walking and by using public transportation in New York, Washington D.C. and San Francisco is the same as using automobiles in Los Angeles? How many times have you found yourself hurrying to make an appointment on time? How many people are in a similar situation on any major thoroughfare in Los Angeles? How many would be upset at unexpected delays? Have any of you noticed that when a bike goes down the rider and bike are not higher than the top of the bumbers on motor vehicles? Have you noticed that usually when you ride your bicycles in traffic if you fall left, you will be under a motor vehicle? How many of you took a driving class in high school and remember that the first car length of travel after a driver recognizes a hazard for which to break the vehicle’s brakes have not even been applied? How many of you are aware that when you are riding a bicycle your ability to avoid hazards are unlike when you are on foot? How many of you realize how fast you would have to run if you suddenly dismounted to not fall down? How many of you don’t stop at boulevard stops but ride through, expecting any drivers crossing the intersection to yield for you? How many of you ride on sidewalks expecting pedestrians to make room for you and not to suddenly step in front of you? This law was written in response to one driver’s deliberate attempt to run down a cyclist, it was not written to consider the larger problems that promoting bicycle riding is having upon the use of roads intended only for motor vehicles and use of sidewalks only intended for pedestrians. I have seen a lot of rules proposed that encourage bicyclists to ride in front of motor vehicles in normal traffic and some permissiveness for bicyclists to ride close to pedestrians on sidewalks and elsewhere. As things stand, people are going to be injured and die because the policies being developed are setting up the conditions for bad outcomes. Roads are not intended only for motor vehicles unless the subject is freeways. In fact, roads were first paved in response to successful lobbying by the League of American Wheelmen in the 1890s, well before the automobile became part of the equation. Cyclists were here first. Coexist. Great work! I am happier after reading this article and the commentary. I drive/commute in an area that is heavily used by bicyclists. I have a lot of cyclist friends as well, and we have our agreements and disagreements, of course. My problem is when you get large groups of bicycle riders who will block a lane of traffic without any regard to the backup or frustration they’re causing. This person’s morning exercise can cost me an extra 10 minutes of driving, and they simply don’t care. It’s akin to that person who insists upon driving 50 in the fast lane…only sometimes I dont have a passing lane to pass them. Some of the cyclists around here are belligerent in their attitude and riding style. So with this new lowered burden of proof.. if I make some bicycle guy upset because I finally had a chance to pass him…he can claim I tried to assault him with my car, and cost me $1000’s in legal fees, time, etc? I wish that the bicycle community would be better about policing themselves. It’s really hard to be a badass and “show these car drivers who’s boss” when you’re riding on a 40lb aluminum pretzel, and putting yourself in harm’s way too. I too can remember before the Lance Armstrong days…back when people on bicycles rode to the right of the inside lane, paid attention to drivers, and were courteous to traffic, since they are in a vehicular roadway, not a bike course. Now bicyclists will take an entire lane, keeping cadence at 18mph, and not even care what’s going on behind them. But god forbid, if you try to pass them (regardless of how safe the pass was) you’ll get yelled at, or worse for “endangering” them. Especially if they catch up at a light or other delay…they’ll be even worse at making your life a living hell for having the audacity to NOT stay behind them at 18mph. Again… the road rage makes it really hard not to just accelerate thru their “critical mass” and continue on my way. We all need to do our part. But bicyclists need to realize that there are some REALLY bad apples out there making it hard on the rest….and that we need to find ways to work together to make everyone’s use of the road safe and efficient. I ride too…so I’m not speaking from a biased perspective. Most cyclists are also drivers, and understand your perspective. In my experience as a driver, however, I am rarely, if ever, held up by cyclists. I am mostly held up by other cars. By contrast, in my experience as a cyclist, I usually find myself threatened by a car on every commute — for instance, the driver who (on Monday) rolled through a stop sign and very close to me on the Santa Monica Blvd. bike path. If the drive had stopped as required, I would have understood her intentions; rolling through it scared the living daylights out of me. Do you ever have similar experiences in your cycling life? Excellent step forward – anyone who has tried to ride to and from work (in the street, commanding a lane, the way the law stipulates) has experience with this.